SEATTLE, WA: Big Trees Inc. (http://bigtreesupply.com/), a tree installation and tree nursery company in the Seattle area, recently helped restore the landscape of a local resident after an act of vandalism left him without trees in his backyard. The tree transplant company was able to bring in new trees from the company’s tree nursery in Snohomish, WA, and the project was completed to the full satisfaction of the homeowner. The situation arose when a neighbor of the homeowner came onto the property and cut down their trees, all to improve the offending neighbor’s view. The homeowner called Big Trees Inc. to help on the matter. The location of the project made it difficult to bring the trees to the site, however by procuring a large crane and positioning it in the street they were able to reach the planting bed for the new trees. 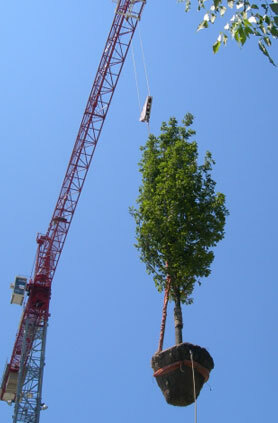 The new trees were brought in from the company’s tree nursery and installed with a crane. The project was completed in one day, and the landscape was completely restored to its condition prior to the trespasser’s violation.